Tonight will bring the first teaser trailer for Marvel's second summer release this year, Ant-Man. 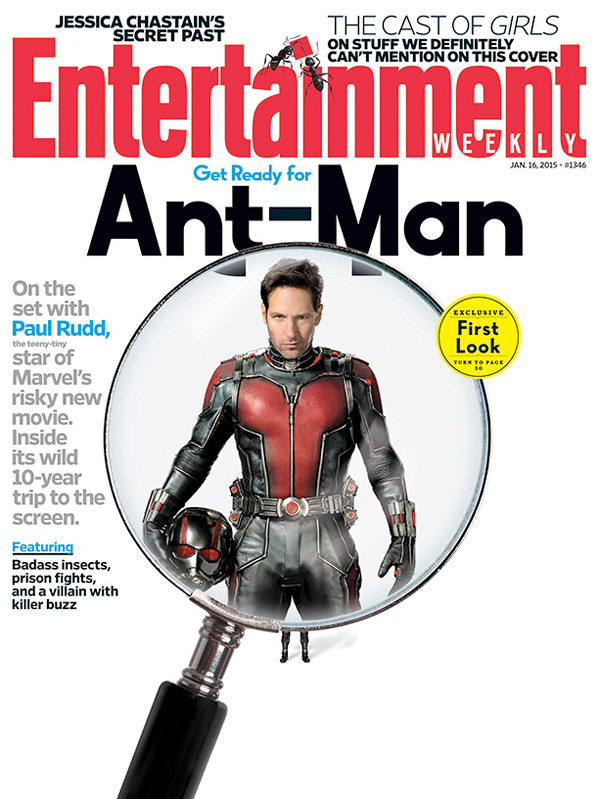 The film stars Paul Rudd, entering new territory as a thief turned superhero who can shrink down to the size of an ant. And hot on the heels of an ant-sized teaser for the film (along with the human-sized one shortly thereafter), the superhero now gets a teaser poster that is actually pretty bold. It shows our title hero, but he's super tiny, amidst a pure white background along with just a title and a date. 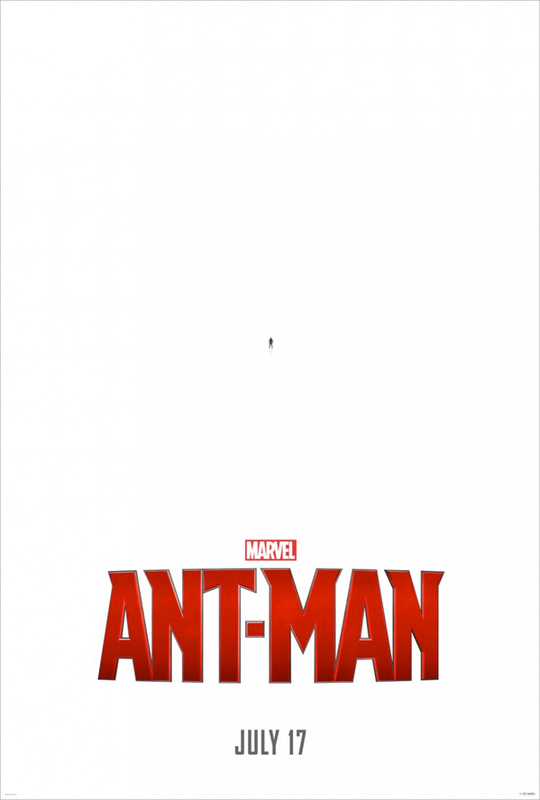 That's a great teaser poster, and I'm impressed they didn't even use the star power of Paul Rudd and Michael Douglas. Look! They really took the easy way out with the poster on this one, not impressed... This is what I would have done, Marvel is better than this. Just thinking the same way. Safe came to mind. I guess that's the joke. This film is Marvel's first attempt in the comedic genre and I found the poster to be pretty clever. I laughed so I think it succeeded in what it was trying to do. Plus, imagine seeing this poster blown up on the wall at your theater, the first thing you'd do is get really close to the picture so you could see it better. It's brilliant marketing IMO. You wouldn't consider GotG as in the comedic genre? I definitely laughed in that film, but it was mostly due to the B-movie nature of it and the corny scenes where they would dance for no reason. Not to mention the guy playing Ronan was over acting quite a bit. All Marvel villains have this Greek feel to them, Greek's invented the drama, he is very dramatic, hence Marvel Villains all maintain the over dramatic personalities, thats what makes the hero's one liners so good. nope, its like saying Fifth Element is a love drama. Its got elements of that, but its a balls-to-the-walls action scifi film, Guardians is no different. I don't think it is going to be any funnier than Guardians - maybe less funny. Who has that image about avoiding movies with their titles in large upper-case red font? Starlord didnt have a helmet, it was mask helmet wrap. God Offical Jab, get it right... but yes they do look similar. Its the red eye cups.. and all the chrome. But in the comics they have similarities in design. But a true definition of a helmet is worn to protect the head, where Starlords does this except protect the top part, so does this make this a helmet, no, its helmet mask hybrid= Mask Helmet. Where ant man helmet looks like it has a re-breather - which is used to talk to ants and control them. Looks soft even with Photoshop. One day they will put a guy in costume and take a pic, and thats it. It will look real, instead of shopped to all hell. A guy can hope cant he? lol at Entertainment Weekly calling it "Marvel's risky new movie." Considering Wright was dropped for being too unique and how safely played these posters are, "risky" is the last word that comes to mind in connection to this movie. LOL. This is going to be a really cute ad campaign.